Know about me Jessica Olins, Esq. Jessica A. Olins’ practice at Maglio Christopher & Toale, P.A., focuses on the representation of clients in nationwide complex vaccine injury litigation. 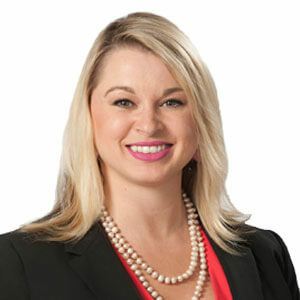 Ms. Olins graduated with her Bachelor’s degree from Redlands University prior to attending and graduating from American University Washington College of Law. While at Redlands University, Ms. Olins excelled in leading and training her colleagues through new developments in spatial mapping, involving geographic information system software and geodatabase management applications. Prior to law school, Ms. Olins was the Paralegal and Office Manager for a boutique personal injury firm in San Diego, CA. During law school, Ms. Olins was involved in the Transactional Law Society, preparing negotiation strategies for disputed contracts. Ms. Olins studied for a semester abroad at the University of Dundee, Scotland, focusing on energy, environmental and natural resources law. She began as a Summer Associate with Maglio Christopher & Toale, P.A., in her second year of law school, primarily focusing on vaccine injury litigation. Throughout her tenure with Maglio, Christopher & Toale, P.A., she has become greatly involved with vaccine fee litigation as an active member in the Firm’s, Fees Committee Division. Ms. Olins’ practice also involves engaging in subpoena enforcement in federal district courts nationwide. Ms. Olins is also a member of the Firm’s Vaccine Injury Practitioners Bar Committee, assisting in the preparation and organization of the 2016 VIP Bar Conference. Ms. Olins is actively involved in her legal and local community. She is a member of the American Association for Justice and its New Lawyers Division. Additionally, Ms. Olins is a member of the Young Lawyers Division of the United States Court of Federal Claims. Respecting the importance of staying current in complex litigation, Ms. Olins is also a member of Trial Lawyers Association of Metropolitan D.C.
Altom M. Maglio and Jessica Olins, Rule 26(B)(1), One Year Later, Trial, Volume 52, No. 11, November 2016. Cecelia H. Stultz and Jessica Olins, Understanding the National Vaccine Injury Compensation Program, The North Carolina State Bar Journal, Volume 22, No. 4, Winter 2017. Prior to law school, Ms. Olins modified import automobiles and became the first female recognized for her work in Tuner Performance Reports Magazine. She was actively involved in the import automobile scene in San Diego, CA, and sponsored by an all-female race crew. Article available at: Tuner Performance Reports, RSX Type S Supercharged VTEC Vixen, Issue XIII, January 2006.